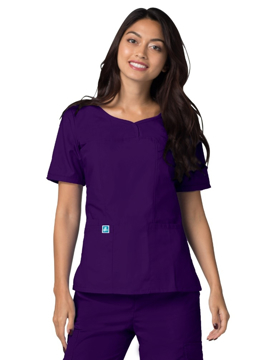 This y-neck fashion top features a locker loop at back neck, inner logo utility tape at pocket, pen holder, inner cellphone pocket, logo D-ring at waist tab, and two front lower pockets. Center back length: 27¾". This tee features FastDry technology for quick-wicking, anti-odor technology, crew neckline, forward shoulder detailing, and self cuff. Center back length: 30". 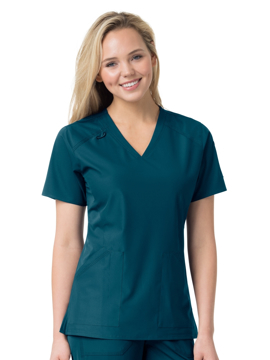 This women's jersey tee features round neck styling with rib knit at cuff and neckline. Carhartt logo screen print at upper back of garment. Center back length: 27¾". This tee features FastDry technology for quick-wicking, anti-odor technology, crew neckline, forward shoulder detailing, and self cuff. Center back length: 28¼".